Traveling to China with twin toddlers was a real mix and ultimately we all remember it fondly. We spent six weeks in Beijing, living first with a friend, then in a rented apartment near the hotel where we have formerly lived (in our childless days!). We then traveled around for another five weeks, first by train to Chongqing to visit family and from there to Fuzhou, also to visit family. That was followed by my favorite part of the trip, a brief stay in an air-conditioned hotel in Fuzhou, followed by the return train ride to Beijing to get ready to return to the U.S. Though the free playgrounds one is used to in the U.S. are practically non-existent, my kids loved the exercise equipment found everywhere. Though intended for adults, they loved playing on this. They also loved the amusement parks, though those are far from free. They loved the yangrouchaun (lamb kebabs) sold everywhere cheaply and sweet and sour anything. I was pleased that they didn’t starve to death. They also loved train travel, much more than I would have thought. Sitting eating instant noodles and watching the world go by was quite the novelty. NOT in the heat of summer. If you do, be prepared to be confined to (if you are lucky) one air conditioned room for much of the day. 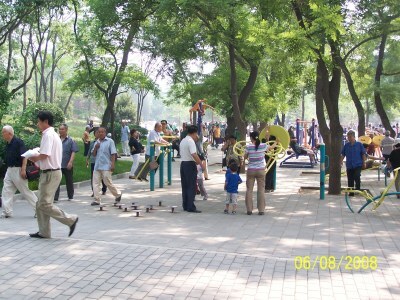 Beijing: Any park was fun, but they especially loved the play area in the purple (they translate at black) bamboo park at Baishiqiao. They could “hop on the bunny” or hop on the balls or slide and generally carouse for 20RMB each (under $3). Beidaihe: The boys did love the sea at Beidaihe – it was still cool, in May, but that meant not crowded and we could still play on the beach every day. We had to avoid the spring sand storms of Beijing. Off season, a decent beach hotel at an affordable price is easy to come by. I can't remember the name, but we paid 170RMB/night (just over $20) for a very nice room. Hotel food was cheap and good too and there were decent restaurants nearby. The beach required some climbing but was not far. We did, however, have one of my worst parenting experiences on a train from Beidaihe to Beijing – a few hour ride on a packed train on which we had to hold the boys and during which one of them woke up and would not stop screaming and we were subjected to all kinds of judgmental stares (along with a few sympathetic ones). the whole time but the boys loved (when it wasn’t scorching hot) the playground in the apartment complex. They also loved a cable car ride up a mountain (which featured a very expensive mountaintop hotel only accessible by rickety suspension bridge). Fuzhou: The seaside of course. – it rained a lot and we spent several days out in a remote village (which did have a fun lake for swimming) but even when a rainstorm interrupted their beach play, they still didn’t want to leave. We were tired by this point and enjoyed staying in this remote village near the water with the one sane relative who didn’t give advice or make us do activities and who even attempted to make pancakes for the boys. We appreciated the thought more than the end product! Be prepared for lots of unsolicited advice on how to rear your children (and parents!). What was most unacceptable to them was to see my 3-year-olds in diapers and even if told it was only for sleeping, that is still too old. 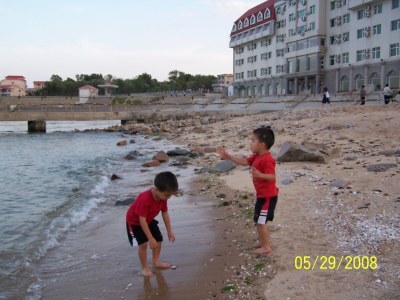 Strangers also felt it necessary to inform us our boys were too skinny and their Chinese family lectured us many times on how we needed to do whatever it takes to feed them more (even if that means chasing them with the spoon). We were also told many times how cold Americans are because they don’t spend their life savings on their kids (well, not all…) and often put their parents in old folks' homes. On the other hand, children are generally treated very well and we never had to worry about getting a seat in a bus. If someone didn’t offer, which they usually did, the ticket lady would free up a seat for us. The problem then was getting the bus driver to not careen off while we were still sitting and before we had completely disembarked! We just had to get used to no car seats, much as it terrified me. Having twins was something of a novelty compared to the US. Every person we passed felt obliged to comment that they were twins and tell us how lucky we were. While that quickly got old, what was entertaining were the times when even other foreign tourists would stop to take pictures of them. Fortunately our reaction to family conflicts didn’t rub off on the twins and they still miss their grandpa and great-aunts! Jenny is a freelance writer and a part-time writing instructor/tutor. She has worked in Europe and Asia. While in China, working as an Editor for Xinhua News Agency and CCTV, she met her Chinese husband. The family lives currently in Indianapolis. We also got a lot of nice "criticism" for having only one kid. (Both my sister and I have only one son each) They could not understand why we would choose to have only one child when we could have more!